I was thinking about a book I reread in the 90’s and thought I’d share how I came to rediscover it. So, that was the gist of the story. It was also the first time I put the then-newfangled Internet to its proper use. I consider myself a pretty decent “keyword artist” and was able to track it down, despite having forgotten the title. 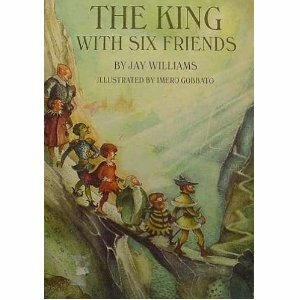 Turns out it was called “The King With Six Friends”, written by Jay Williams. I will never forget receiving the book in the mail and reading it for the first time in over thirty years. It was truly just as I had remembered! But here’s the surprising part; while the story had changed little in my memory, neither had the feeling I had inside as I read it. As we get older, the way we look at things change. However, while there are different triggers to different feelings and emotions, the effect of those emotions on the who we still are, can be the same. Happiness is still happiness. Sadness is still sadness. In reading this book, the warmth of friendship and the feeling of satisfaction in watching the impossible overcome had not changed. Nor did the ability of Imero Gobbato’s illustrations to draw me into this world. In a way, this was time travel, or as close to it as I’ll ever come. What a journey this book has been on. It began at Northword. As I was halfway through the paintings, I got an E-mail from my editor saying Friday was her last day and the company was in the process of being purchased by another – nameless – company. She told me there were no guarantees the new company would pick up my contract. Their declining to do so, of course, would leave me unpaid for the work I did. She said that it was up to me to take the gamble of finishing the book for some yet-to-be-named publisher who may have no interest in it. Legally, they were under no obligation to do so. This kind of thing happens way more than you think in the children’s book publishing industry. I’ll tell you about a nearly identical situation with an upcoming (Fall 09) book I illustrated (A Daddy Longlegs Isn’t a Spider) some other time. I should say that as bad as I was feeling about the fate of this seashore project, I felt even worse for my editor, who had just lost much more. I still had a month’s worth of paintings to create in order to complete the project. That’s a lot of time that could be spent working on other projects with a better outlook toward producing income. I don’t do this as a hobby. One of the research highlights occurred while looking for sandhoppers, little crustaceans that live among the seaweed and hop like fleas (they’re also called beach fleas). I noticed that 2 young boys were watching me, trying to figure out why that man was sifting through the beach jetsam. They finally got up the courage to ask, and when I told them what I was doing, they asked if they could help. This attracted more attention, and I was soon joined by a little girl, her brother, and then, her mother. I remembered being warmed by the sight of this loose band of seaweed flippers spread out along the beach hunting for something they most likely never noticed before. This is the kind of stuff I dream my books will inspire after they read them. That it came before, was just as fulfilling. Oh, so anyway… the publisher turned out to be Taylor Trade, a division of Roman and Littlefield. They picked up my contract and it’s now a book. I guess my gamble paid off. If you want a copy, and your local bookstore doesn’t have it, they will order it for you. Amazon and B&N carry it online – or go here. To paraphrase General Patton, “Children’s Book illustration is hell!” Or at least it can be. I’m not talking about the dismal state of the business these days. The publishing world has not been spared from our country’s economic woes. No, I am talking about the simple act of creating a picture. They found a chair to sit upon - finally! The problem I was having was with the chair. The chair is, in a way, a central character to the book. It’s in every illustration. What changes from page to page is the number of wiener dogs on that chair. I just could not find the right color combination! I must have done about twelve different paintings. Fortunately, I was able to use my copy machine to reproduce the black and white images, which saved me a lot of redrawing. The blue was a little too dark. And the brown in the blanket got too muddy. I thought the tan would help the dogs stand out more. But the purple blanket just did not fit and the dogs were kind of blending in with the background. What I would do is complete a painting and let it sit a while. Sometimes, when you’ve been staring at a picture too long, you lose your objectivity. Your mind either tells you it’s better than it is, or worse. Still way too yellow. But the blanket and pillow were not too distracting. BARF! Too yellow! Too yellow! I then added some green to get a sense of how that would work against the color of the dogs. The result? BARF SQUARED! Ripped and then tossed into the air behind me. Then, after nights of actually losing sleep over this, I was lying in bed – it was about 4AM – and had an epiphany. I not only saw the color in my head, but knew how to make it. I pictured mixing white watercolor with a semi-pale blue. The blue and the orangish color of the dogs were more or less complimentary colors on the color wheel scale. When you put complimentary colors next to each other, they “pop”. Three hours later I was at the drawing table mixing and applying those combinations. The color matched what I had imagined and I think I finally got what I was going after. That battle has ended. The wiener dogs have a pale blue chair on which to cavort. Here, by the way, is the second sample I worked up, showing all ten of them. One would think that there could be few joys in life greater than painting frolicking wiener dogs. Should this book sell, I think that I’d finally be able to experience that joy. Unless the art director hates the blue chair….